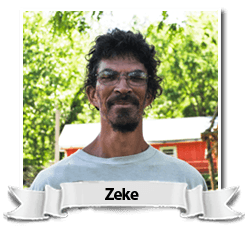 Hi, my name is Zeke and I've been living at East Wind Community and helping make our nut butters for about twenty years now. East Wind, and the nut butter business in particular, has provided me with an amazing learning opportunity. I’ve done everything from fixing an outlet to helping design and install our second production line, from filling a jar of peanut butter to fixing the mill, from packing a pallet to helping manage our business. It's hard to imagine a place with more freedom and opportunity to learn while doing. When I'm not working in the Nut House, I like to fix stuff like plumbing in our laundry room, or build things like our new dairy barn. When I'm not working, I love to enjoy the woods and rivers of the Ozarks—whether for a week of canoeing on the Current River or just an afternoon at our own creek with a beer and some peanuts. I hope you enjoy our products as much as I enjoy making them. Peace, Love, and Peanut Butter! Currently East Wind Nut Butters is the primary business and main source of income for East Wind Community. The sustained efforts of community members over the past 30 years to build and maintain the business have made it possible for East Wind to become a stable, thriving community. We realized early on that we needed a business to support our dream. In the autumn of 1974, East Wind was a year and a half old and had been on the land for six months, yet we still had no business of our own. We were supporting ourselves by sending people to work on a rotational basis to cities such as Springfield and St. Louis. A period of outside work is an extremely difficult time for any community, and it was taking its toll. At that time, Twin Oaks, our sister community, asked us to partner with them. Twin Oaks had been in the rope hammock business for several years, and just took on a major retailer as a new account. This required more production than they could handle alone, so they asked if we would share in their business. The hammocks industry involved little investment, required little skill, had a quick and decent payback, and offered a pleasant work environment. Our relationship with Twin Oaks Hammocks provided East Wind a sound business which grew from workers in surplus army tents to a 6000 square foot industrial building. We started an offshoot business, Utopian Rope Sandals, in 1976. Some members got the idea that something could be done to utilize the scrap rope from our hammocks. East Winders have always been resourceful! After some experimenting they put together what we believe were the first rope sandals made in this design. Others have copied the design but they all trace back to an East Wind origin. In any case, we think ours are the best. The sound financial base that East Wind built during those years helped grow the community in population and in size. Members were still on the lookout for a business idea of our own that could grow to fully support the community. 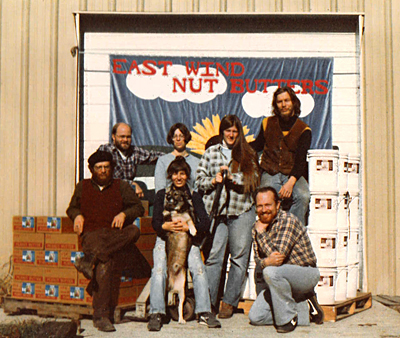 Our resources were used in 1980 to finance our own totally new venture: East Wind Nut Butters. The idea came via a visitor to East Wind in the early days, who went on to start a nut butter business in Colorado. He contacted one of our members, Malon, and told him about his success. This planted the idea of East Wind Nut Butters. From there, members John and Malon went on a fact-finding mission to several peanut butter factories to learn about how they operated. They selected a final production design and co-sponsored a proposal to start the nut butter business (all major decisions at East Wind are voted on by the community). Other members had contact with Once Again Nut Butter Collective in New York, who offered to help. With the help of Once Again Nut Butter Collective, we began researching and arranging financing. We started the business with a $250,000 dollar loan (a big deal in 1980 dollars) from the National Cooperative Bank. We started building facilities and buying equipment for our new nut products business. 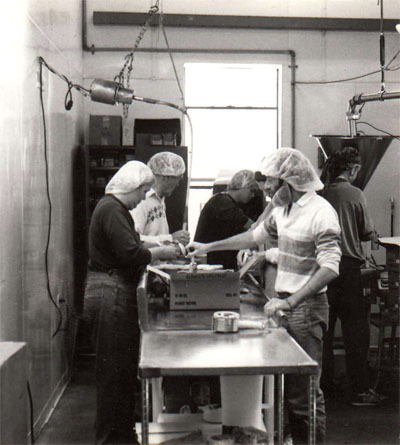 In 1981 we completed the “Nut House” and started producing peanut, almond and cashew butters, tahini, and roasted nuts. Over the years we have expanded and improved our production facilities quite a bit. The initial nut house was 40ft by 50ft and was about half refrigerated storage and half production, capable of producing perhaps a thousand pounds a day. It housed one production line, 'Line One.' 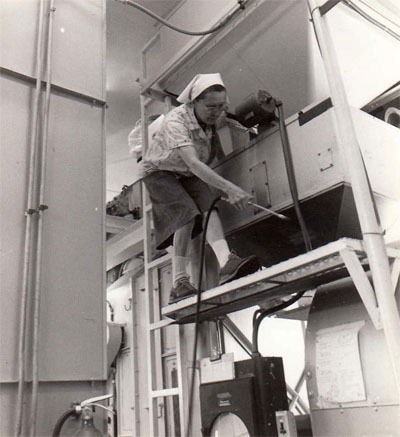 The line had a propane dry roaster with an elevator and cooler, a separator, a blancher, and a small mill. A larger mill was purchased soon after. Raw nuts were stored in two refrigerated semi-trailors, while packaging shared a warehouse with hammocks and sandals rope. 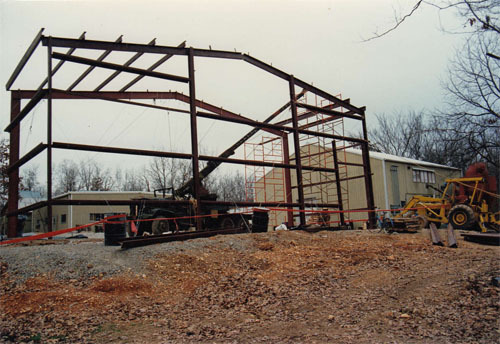 In 1994 we built a dedicated 3500 sq ft refrigerated warehouse, 'Siberia.' 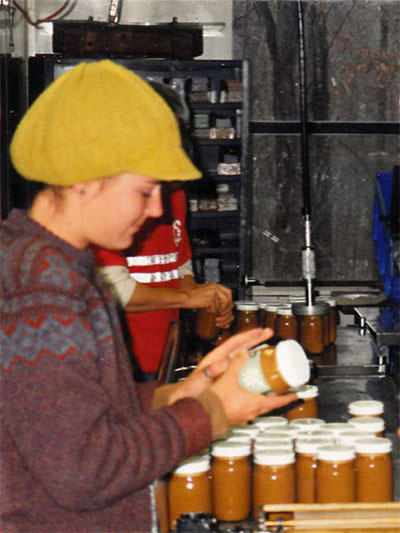 In 1999 we built a second production line, so we would have separate lines for peanuts and for our other nut products. Like 'Line One', 'Line Two' has a propane dry roaster with an elevator and cooler, and a small mill. We don't need a separator and blancher for tree nuts. We can now produce thousands of pounds an hour of a quality product we can be proud of. 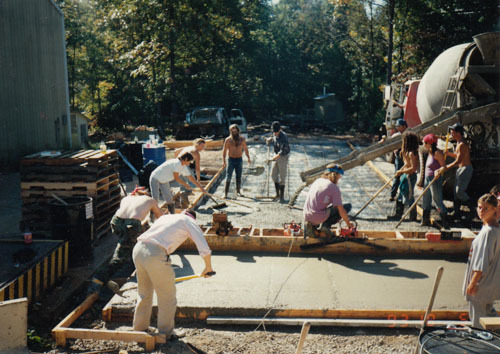 In years that followed we continued to make improvements to our facility. We built a separate dry storage building to store packaging materials--boxes, buckets, glass jars, etc. We bought amazing machines called the lidder-capper and the Label-Aire to put lids and label our 16oz jars. Believe it or not, these jobs were done by hand before! We also bought a heat sealer, a small oven used to seal the jars in compliance with FDA regulations. Today East Wind Nut Butters is still producing a natural and wholesome food product with labor provided by income sharing communitarians in a worker owned cooperative. We hope you enjoy our products!